A good horned helmet is an iconic representation of a typical Viking and his preferred headgear. And this Viking Horned Helmet would have fitted a Viking perfectly, featuring a simple, protective style that features large horns adorning its sides. This helmet is simple in design, featuring a round crown that is reinforced by strips of metal running horizontally and vertically across the helm. 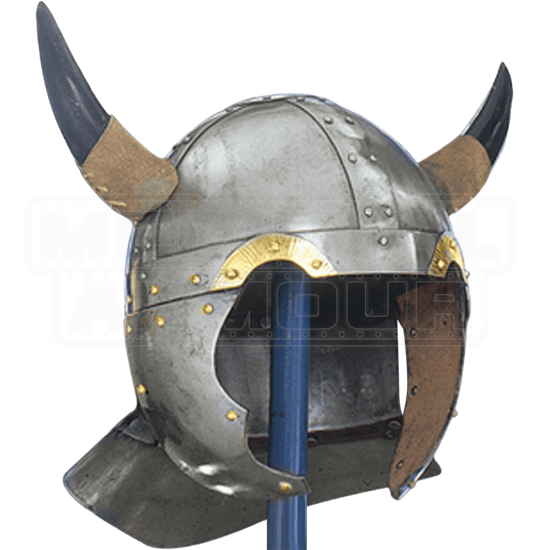 Extending down from the sides of the helm are two cheek protectors, which help to protect the wearers face, while the back of the helm is flared out to defend the neck as well. Decorative gold-colored rivets adorn the helmets cheek flaps, while subtle curves are smithed into the helmets edge, as though making room for the eyes. The final touch to the helmet is, of course, the horns, which adorn the sides of the helmet and stick out, giving this helmet a truly impressive silhouette that is unquestionably Viking in nature. The helmet is made from quality metals and features subtle gold-colored decorations in addition to its decorative horns. Putting on this Viking Horned Helmet is definitely one of the fastest ways to make yourself feel like a real Viking, ensuring that this piece is a great accessory for costumes and ensembles, as well as a great display piece to include in your own collection.